My Second Love: How should Christians vote, if at all? How should Christians vote, if at all? As Christians, we ought to marvel at Jesus’ desire for the separation of Church and State. And we must desire the same. We rightly separate Church and State by giving to God what is His (Luke 10:27), and giving the world, what belongs to it; our freedoms in Christ to obey His precepts and bless the world by supporting those who uphold God’s laws for the protection and provision of His saints (see Gen 41:37-41, 45:7-8; Jeremiah 25:8-9; Is 44:28, 45:1). Throughout biblical history, when God’s people have waned from wholeheartedly following His Word, He lifted up pagan leaders (e.g., Pharaoh of Joseph’s time, King Nebuchadnezzar of Babylon, King Cyrus of Persia, etc.) to care for and discipline His wandering flock so that we might turn back to Him and away from all wickedness. And a vote to whom a vote is owed. Provide God’s people the freedom to worship the Almighty as He has commanded. This election is one of the most critical elections in our country’s history within the past century. Don’t allow apathy, pride, disgust or the opinions of others direct your heart to do what is displeasing before the sight of God. 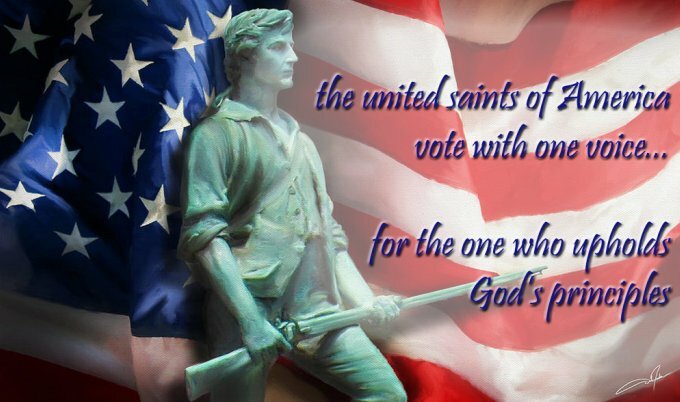 Let us behave like united saints of America and together, with one voice (Ex 24:3; 1 Cor 1:10) vote our faith; vote with a clear conscience before God and all people (Acts 24:16); to help promote, protect and defend what little morality is left in our country. Note: National and state nonpartisan voters guides are available at: Christian Voter Guide and Citizen Link (a ministry of Focus on the Family).